Indulge yourself with this handmade, bakery-inspired bath bomb! Just drop in the bath tub and enjoy a soothing and relaxing bath experience that will not only tickle your senses, it will leave your skin lightly moisturized. Plus, it is topped with an adorable macaroon soap. Will make a great gift for yourself or a loved one. 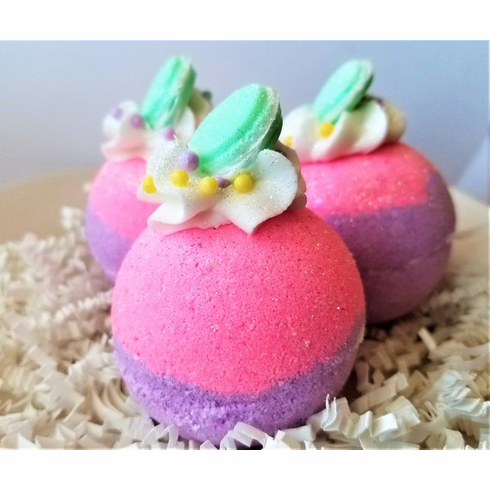 In addition, you get a discount when you order 10 or more so these vanila cream bath bombs will make great favors for your bridal shower, baby shower, or any occasion. Just convo me for more info. This listing is for one bath bomb. Bath bombs weigh approximately 5 ounces. It is purple and pink, topped with white frosting, sugar balls, a mini mint macaroon soap, and a light dust of glitter. Contains almond oil, avocado oil, sunflower oil, and jojoba oil. Scented in a lovely buttercream vanilla fragrance.